When we turn to the commentary itself, there are three main parts to Perkins’ study of each passage. First, she goes over “introductory matters.” Then you will find the “Tracing the Argument” section which goes through the various exegetical issues. Finally, you have a reflection on the “Theological Issues.” Again, given how short the commentary is, you will not find many “new” insights. One of the most useful features, though, is the frequent call-out boxes. For example, on pg 51 she notes that religious associations in the Greco-Roman world did sometimes have rules against dividing into factions: “And to no one of them is it permitted…to organize factions [schismata]” (papyrus London 7.2193 in Arzt-Grabner et al., 2006, 66). In another call-out box she notes griffiti discovered that shows fans favoring one member of an acting troupe: “Actius star of the stage…Here’s to Actius, come back to your people soon” (see p. 55). While one of the endorsers, Frank Matera, is right that this commentary is “learned and concise,” I am not sure I would recommend it as a textbook. The strength of her text is focus on the archaeological insights for the study of 1 Corinthians. However, I would combine something like Jerome Murphy O’Connor’s St. Paul’s Corinth, Craig Keener’s 1-2 Corinthians (New Cambridge), and Bruce Winter’s After Paul Left Corinth. 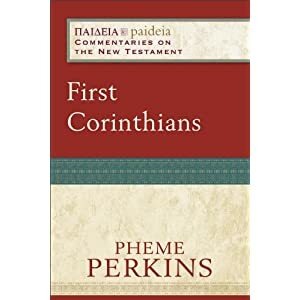 Even though I did not find Perkins’ volume as useful (maybe because I already own a swath of 1 Corinthians commentaries by Thiselton, Fee, Garland, Hays, Fitzmyer, Sampley, Blomberg, Ciampa/Rosner, Witherington), I still have interest in the Paideia series and I think it has a lot of potential. 1 and 2 Peter is coming soon from Duane Watson and Terrance Callan (August 2012) as well as James and Jude (John Painter and David deSilva) just in time for SBL (Nov 2012). Don’t get me wrong. I always consult Garland and Ciampa/Rosner. But Fee and Thiselton were major influences on Ciampa and Rosner, so it is hard to argue that they “outshine” them. I actually studied with Ciampa and I think he would respect Fee and Thiselton as both magisterial evangelical commentaries on 1 Corinthians. Ciampa would be very flattered by comments in any case. Yikes – another book I have to read? Could everyone stop publishing on 1 Corinthians for a bit!